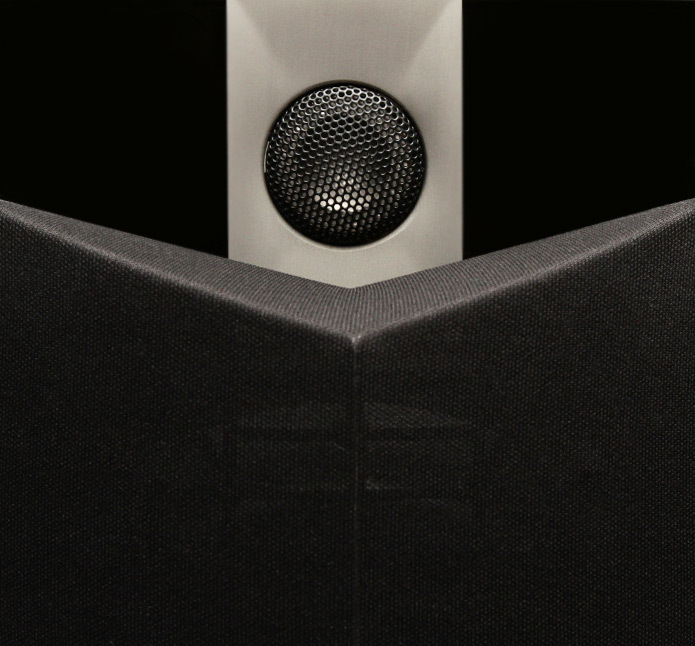 It’s fairly common in the world of high-end loudspeakers for a company to first use a newly developed technology in its flagship model, and only later apply that technology to its less expensive models. This practice is especially common in bigger companies, where ongoing research and development ensures a steady stream of new ideas and approaches. 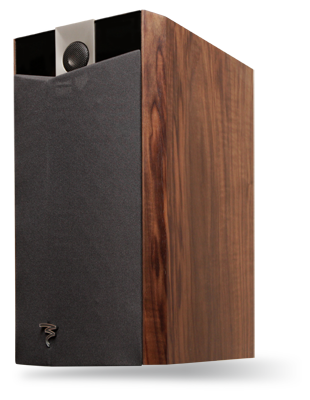 A good example is the Chorus 807 W ($1599 USD per pair), one of two bookshelf models in the Chorus 800 W Prestige series of speakers from venerable French manufacturer Focal. By combining design elements from their flagship Utopia and less-expensive Chorus V models, Focal has created a series of speakers that bridges a gap between their mid-level and high-end offerings. If you visit Focal’s website, you’ll likely notice that the Chorus 800 W and Chorus 800 V models look very similar. That’s because the same cabinet shape, produced by Parisian industrial design firm Pineau & Le Porcher, is used in both lines. The profile of the 807 W’s cabinet and the neckline of its grille are both in the shape of a V. In combination with the striking Red Carmin High Gloss my review pair came in, this gives the French speaker a very distinct personality. However, the V shape isn’t merely for appearance’s sake: the sides of the speaker gently taper in toward the rear, resulting in opposing nonparallel surfaces that help break up standing soundwaves inside the box -- a good example of form following function. The walls of the cabinet are made of MDF ranging in thickness from 0.8" to 1.0", and are internally braced to keep resonances at a minimum. Another similarity between the Chorus V and W series is that they share the same 1" TNV inverted-dome tweeter. 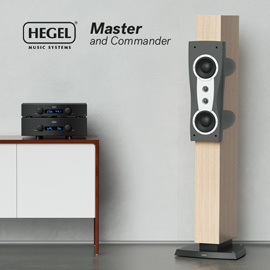 This updated version of Focal’s TNC tweeter was created out of what the company learned while developing the tweeter for their previous flagship floorstanding speaker, the Grande Utopia Be. Unlike the beryllium driver used in the Utopia, the TNC and TNV tweeters are made of an aluminum-magnesium alloy said to have very good damping properties. Although the TNV is based on the TNC, it features several modifications, including a new foam surround and a redesigned neodymium motor system, all of which are said to reduce harmonic distortion to as little as one-sixth that produced by the TNC. While the tweeter benefits from technology developed for the Utopia series, the 807 W’s high-end pedigree is truly revealed by its midrange-woofer. The cone of this 7" driver is made of Focal’s W material, a patented composite used in the Utopia line that comprises multiple thin layers of glass on both sides of a central foam layer. Together, these materials are said to produce a light yet rigid diaphragm with excellent self-damping properties. 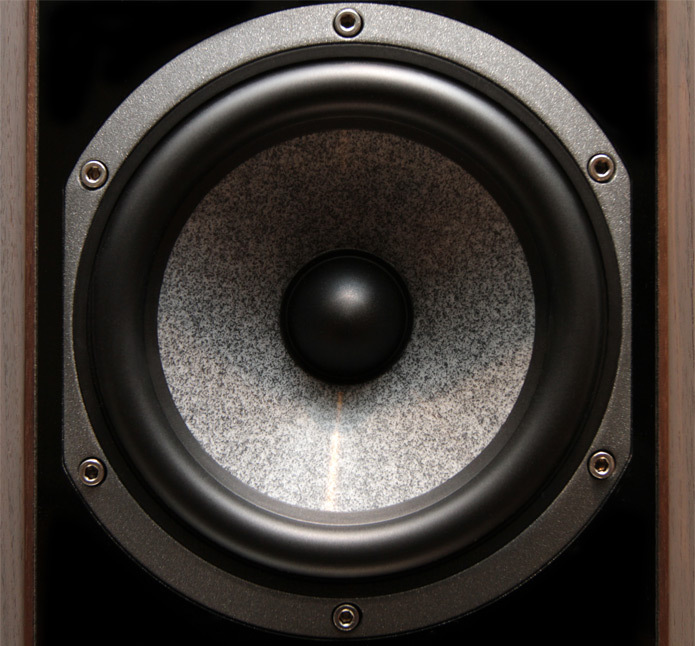 By varying the density of the glass, the number of layers, and the thickness of the foam, Focal is able to adapt the W material to be used as a midrange driver, a woofer, or, as in the 807 W, a midrange-woofer. 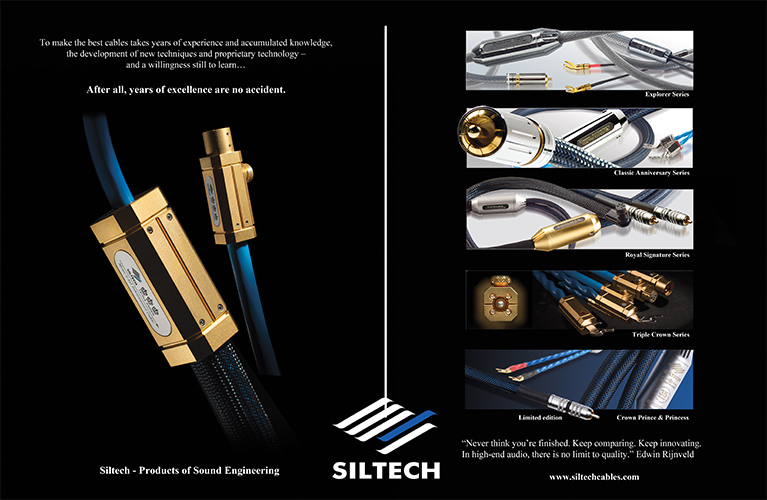 Both tweeter and midrange-woofer are made in-house by Focal and are crossed over at 3kHz. Measuring 17 5/8"H x 9 1/3"W x 13 1/8"D and weighing 22.2 pounds, the 807 W is on the big side for a bookshelf speaker, though not obtrusively so. What makes you take notice of them is not size but style. When I first unpacked and set them up, I thought they looked a little too gaudy for my more minimalist tastes. However, as time went by I grew accustomed to them, and thought they looked pretty good in my room. While the top, bottom, and rear panels are finished in high-gloss black, the buyer can choose from one of several finishes for the side panels, including French Walnut veneer, Black or White High Gloss, or the aforementioned Red Carmin High Gloss. Ultimately, a speaker like Focal’s Chorus 807 W Prestige will be more at home in a room with contemporary décor, where it can accent the space with its distinct personality, than it was in mine. Focal claims a frequency response of 50Hz–28kHz, ±3dB, for the 807 W, and a sensitivity of 92dB. Combined with its 8-ohm impedance, the 807 W presents a very modest load for an amplifier; it shouldn’t be too difficult to drive. My 100Wpc integrated amplifier provided the Focals with all the juice they needed to come to life. To provide the 807 Ws with that power, a single pair of binding posts near the bottom of the rear panel accepts spades, banana plugs, or bare wire. I perched the 807 Ws atop 24"H Osiris stands and hooked them up to a Bryston B100 SST integrated amplifier with AudioQuest Type 4 speaker cable terminated in banana plugs. An NAD C542 CD player was used as a transport, its digital signal sent to the Bryston’s onboard DAC through an AMX Optimum AVC31 coaxial cable. I used a Thorens TD-160HD turntable with Rega RB250 tonearm and Dynavector DV-10X5 high-output moving-coil cartridge to play LPs, and wirelessly streamed music from my Apple iMac computer through an Apple Airport Extreme to an Apple Airport Express. An XtremeMac XtremeHD TosLink cable connected the Express to the Bryston’s DAC. Everything was plugged into an ExactPower EP15A power-line conditioner-regenerator. As I usually do when I get a new pair of speakers in for review, I began by setting up the Focals in the same spots I use for my own speakers, Amphion’s Argon3Ls. The front baffles of the 807 Ws were thus 3.5’ from the front wall, and toed in so that their tweeter axes crossed just behind my head. I listened for a while and was underwhelmed by the way the Focals reproduced the oomph of a kick drum or the weighty tones of a bass guitar, so I moved them a foot closer to the wall. Listening to "Girl I Love You," from Massive Attack’s Heligoland (CD, Virgin 5 9466 2), I found that the bass had gone from a little too lean to a bit murky. It was definitely more fleshed out than before, but not as clear as I wanted. I can imagine some people preferring to keep the 807 Ws closer to the wall to get as much low end as possible, but I tend to favor bass definition over sheer bass output. I split the difference, leaving the 807 Ws with their front baffles 3’ from the front wall, and was rewarded with a broad, three-dimensional soundstage with well-articulated, sufficiently voluminous bass. This was evident on "Paradise Circus" (from Heligoland): the Focals produced a strong bass rhythm that provided a good foundation for Hope Sandoval’s voice. As handclaps emerged from behind the singer, the sense of the stage’s depth was palpable, and the whole sonic picture came into focus. Needless to say, I did the rest of my listening with the 807 Ws in these positions. Once they were set up properly, I was impressed by the 807 Ws’ reproduction of scale and impact. "Your Rocky Spine," from Great Lake Swimmers’ Ongiara (CD, Nettwerk 30691 2), emerged as a wall of sound spread across the front of the room. Strings sounded crisp, the bass was taut and punchy, and Tony Dekker’s voice was cleanly reproduced. The presentation of the band and their positions on the stage sounded coherent. The drum kit in "Backstage with the Modern Dancers" sounded especially good, conveying good impact but not as much bloom as I’ve heard from other speakers. Some listeners might crave more bass extension; positioning the Focals closer to the front wall will satisfy this to a large degree. No one will accuse the 807 W of sounding laid-back or recessed; its sound was sharply detailed and prominent, almost unapologetic in its ability to get in my face and draw my attention. The voices in the title track of Atlas Sound’s Parallax (CD, 4AD 3130-2) were centered between the speakers, against a backdrop of gently strummed acoustic guitar, strange computer blips, and the crisp metallic resonance of shimmering cymbals. The Focals did a nice job of sorting out everything to produce a forward-sounding, highly immersive soundscape. Much of the prominence of the 807 W’s sound was a function of its extended high frequencies. Some speakers trail off a bit at the top end, but not the Focal. Rather than rolling off the treble, the 807 W soared well into its upper registers, which made its sound more incisive. Through the Focals, the singing of Gothic Voices on A Feather on the Breath of God, a collection, directed by Christopher Page, of sequences and hymns by the 12th-century abbess Hildegard of Bingen (CD, Hyperion CDA66039), was sublime. In Columba aspexit, as the forward-sounding voices climbed effortlessly into the highs, the 807 Ws did a fine job of delineating individual singers and portraying a realistic, sonically tangible image in front of me. The sense of space in the Church of St. Jude-on-the-Hill was not as grand as I’ve heard through some other bookshelf models, but it didn’t detract from my enjoyment of this music. I was further able to appreciate the Focal’s clarity by listening to "Singer Castle Bells," from Great Lake Swimmers’ Lost Channels (16/44.1 AIFF, Nettwerk). As its title suggests, this brief (0:48) track is a recording of bells; I occasionally use it to evaluate a speaker’s ability to communicate low-level details and acoustic space. The 807 Ws acquitted themselves well, presenting a spacious sound against an ink-black background -- the creaking of the mechanism used to ring the bells sounded as clear as the bells themselves. The Focal’s astute character was showcased again in Loreena McKennitt’s performance of "Cymbeline," from her Live in Paris and Toronto (CD, Quinlan Road VE 15045). They did a nice job of positioning the singer solidly front and center on the stage, the detail in her voice surpassed only by the exquisite precision of the strings of her harp. The yelps and cheers of the very appreciative Paris audience indicate that this show was a lot of fun, and were ably conveyed by the 807 Ws. The 807 W’s clarity really complemented vinyl playback. In "Peeping Tomboy," from Kurt Vile’s Smoke Ring for my Halo (LP, Matador OLE938), notes sprang from the strings of the acoustic guitar, vibrating with wonderful lucidity against the warm, woody resonance of the instrument’s body. This album sounds especially good on vinyl, and the Focals did a commendable job of reproducing the medium’s generally fuller sound while retaining the precision and focus that are necessary to retrieve detail. 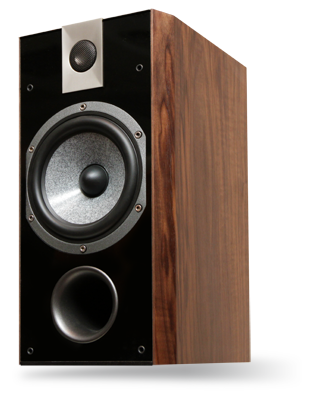 I evaluated the Chorus 807 Ws against my own speakers, Amphion’s Argon3Ls ($3995 in real-wood veneer). Made in Finland, the Amphion is a floorstander that, like the 807 W, has two drivers: a 6.5" midrange-woofer and a 1" titanium-dome tweeter. Unlike the French bookshelf’s, the Argon3L’s tweeter is at the base of a deep waveguide that, among other things, helps control the tweeter’s dispersion and increases the speaker’s sensitivity. What greatly separated the French and Finnish speakers was their performance at both ends of the audioband. In the bass, there was no competition. While both speakers produced good, clean bass, the Argon3L dug way deeper and played with far more authority down low. The deep bass line that permeates "Hustle Blood," from Big Boi’s Sir Lucious Left Foot: The Son of Chico Dusty (CD, Def Jam B001437702), is a good test of how low a speaker can go. The Focal had no problem reproducing some of the power of these low frequencies, but it was no match for the Argon3L, whose bass output with this song can be described only as prodigious. With the Focals I could feel the bass in my chest, but with the Amphions those low-end beats saturated my entire body. This was hardly a surprise, given the discrepancy in their sizes and, more important, price. A fairer comparison would have been of the Argon3L with one of the floorstanders in the Chorus 800 W line, such as the 826 W ($3699/pair) -- or the 836 W ($4499/pair), which Doug Schneider just reviewed. The 807 W produced fairly deep bass, but if you want really deep bass, you’ll have to move up to a larger, more expensive speaker. The two speakers were also easily distinguished by their performance in the upper treble. It was evident with Columba aspexit, from A Feather on the Breath of God, that the Focal had more energy up top than the Amphion: the extension in the uppermost register of the sopranos was rendered with stunning clarity through the 807 W. Whereas the Argon3Ls sounded more laid-back and positioned the singers farther away from me, the 807 Ws delivered the more intimate performance. Both pairs of speakers sounded very good, but I preferred the Focals: they made it easier to hear the quality of individual voices. Given the difference in price, this is quite a victory for the Focals. The Focals also held their own in soundstaging. Playing "Reckoner," from Radiohead’s In Rainbows (LP, TBD Records TBD0001), the 807 Ws were able to place the tambourine outside the left speaker and the drums just beyond the right speaker, creating a broad stage with good center fill populated by well-defined images. The Argon3Ls were essentially able to produce the same wide stage, but placed these sounds a little farther back. Each speaker did a nice job with "Reckoner," but the fact that the Focals performed so well against much more expensive competitors speaks well of their quality. While the Chorus 807 W didn’t do everything as well, it fared solidly against the Argon3L. Considering that it costs less than half as much as the Amphion, it offers good value, and should cause the potential buyer to think twice before investing in significantly more expensive speakers, particularly if deep bass isn’t a priority. With its contemporary good looks, spacious sound, and extended highs, Focal’s new Chorus 807 W Prestige will be a welcome addition to many listening rooms. Incorporating technology trickled down from Focal’s flagship Utopia series, this bookshelf model will provide its owner with a taste of what the best has to offer at a considerably lower price. The pair of them sounded wonderful with all varieties of music, and did a very good job of extracting detail without sounding too dry or analytical. If you’re in the market for new speakers and want something that will make a bold visual statement while bringing your music collection to life, listen to a pair of Focal’s Chorus 807 W Prestiges. Price: $1599 USD per pair.